Our collection is based at Bo’ness, on the southern shore of the Firth of Forth, sixteen miles west of Edinburgh. The picture above shows some of our star railway vehicles. We also have a significant object and archive collection, illustrating the history of railways in Scotland, a history which of course is still being written. 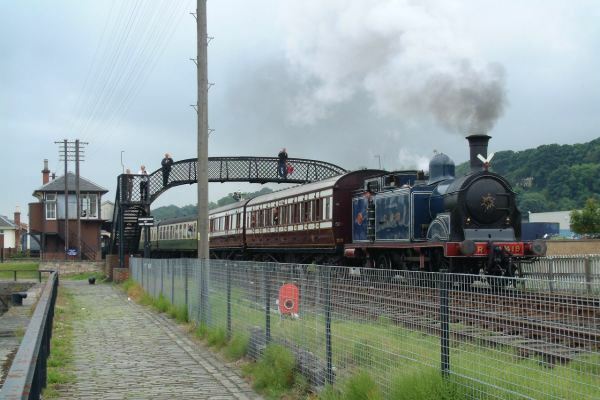 Bo’ness is the terminus of the Bo’ness & Kinneil Railway, where the collection can be seen in action. Most of the railway heritage items not currently operating are displayed in the Museum of Scottish Railways, or in our new vehicle display area, beside Bo'ness Station. Some items are kept in buildings which do not have public access, but there are occasional guided tours to these - check the main SRPS website for further details. This website presents the SRPS railway collection, and will take you into the world of Scottish railways. Details of the website editor and authors are available on the About this Site page. We welcome constructive comments, corrections and additional information. Please use the Feedback Form. We were awarded full Accreditation status, as the Bo'ness & Kinneil Railway, on 30th April 2009. The award demonstrates that we have achieved defined national standards relating to governance, visitor services and collection management. Our collection has also been recognised through the Scottish Government Recognition Scheme as being of national significance. A major new collection has been donated to the Museum by the family of Mr Forbes Alexander. This extensive collection of Scottish signalling items and photographs is currently being catalogued and access to it can be obtained by e-mailing Museum.